I am fortunate to have whom I consider to be the absolute best neighbors in the world. They live across the street from me. For the first six years, I did not reside in my home, but rather, visited several times each year. During the first six years, we became friendly with one particular couple. And then finally, on September 1, 2015, it happened! I was able to semi-retire and move to my dream house in my fantasy world, although it was neither a dream nor a fantasy. It was real life. Ah, so much to be grateful for today. Since then, we (my partner, Richard, and I) have become endearing friends with Skip and Cynthia. But, I am digressing here just a bit. Back to being on point…. 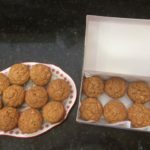 If you’ve been following this blog, you might have realized by now that I not only love to cook, but also have a real passion for baking as well. 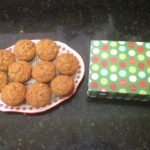 Coupled with that, it positively feeds my soul to gift my baked treats to those I love. 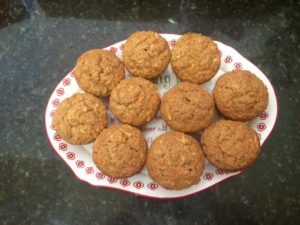 Skip is diabetic, so I tweaked my original carrot muffin recipe (which was not vegan) into a delicious (and quick and easy) sugar-free carrot-apple muffin in his honor. 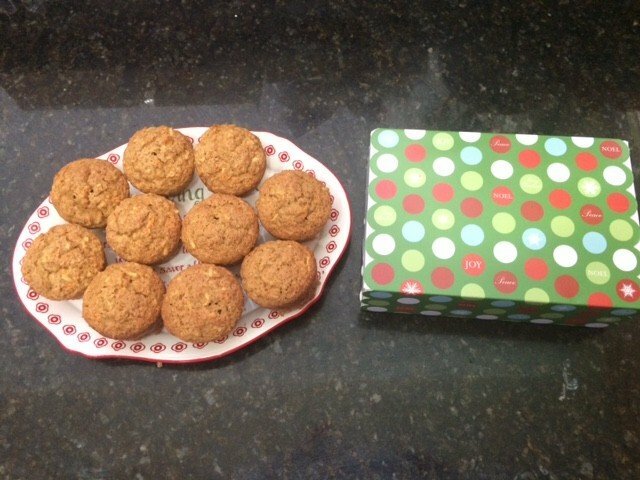 I just finished baking these muffins as part of my Holiday gift to Skip and Cynthia. 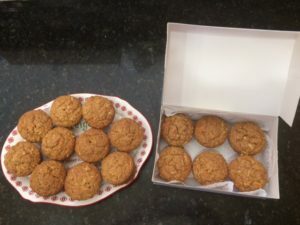 I will be presenting these baked goodies to them on “The Giving Plate”. 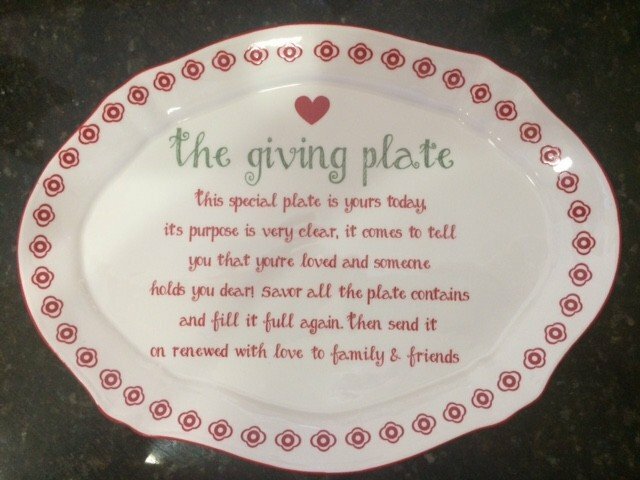 The giving plate reads: This special plate is yours today. Its purpose is very clear. It comes to tell you that you’re loved and someone holds you dear! Savor all the plate contains and fill it full again. Then send it on renewed with love to family and friends. So, here’s my new, veganized recipe. 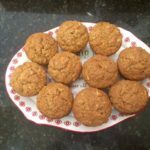 At the very end, I will include my former original non-vegan recipe, since after all, this blog is “veganification”, celebrating the journey of becoming and being vegan. That includes recipes in addition to us sentient beings. Preheat oven to 360 degree Fahrenheit. Prepare a standard size cupcake tin by lightly spraying with an organic oil. In a large bowl, whisk flour, erythritol, baking powder, baking soda, cinnamon, and salt together. In a smaller bowl, whisk water, oil, orange juice, and VeganEgg together. Add the wet ingredients into the bowl with the dry ingredients, and whisk until well blended. Stir in the carrots and apples until well distributed throughout the batter. Using a standard size ice cream scoop, place one scoop of the batter into each well. Bake 28-32 minutes or until a toothpick comes out clean. Allow to cool in the pan on a wire rack for 20 minutes, then remove muffins from tin and allow to cool completely on a wire rack. You can use this batter to make a cake by pouring equal amounts of batter into two prepared 8”-round cake tins or into a prepared bundt cake pan. Lower oven to 350 degrees Fahrenheit. If using cake rounds, bake 28-32 minutes. For a bundt cake bake 50-55 minutes. In large bowl, beat wet ingredients with sugar until well blended, at least 2 minutes. Add dry ingredients in 3 steps, just until blended.